Area police launched their second beachfront sweep for loiterers and suspected prostitutes in as many weeks, this time expanding their net to Walking Street. More than 100 Pattaya and Chonburi officers fanned out just after midnight Oct. 17, targeting Thai and foreign women congregating on both Beach Road and Walking Street, as well as transvestites believed to be responsible for pickpocketing and petty crime. 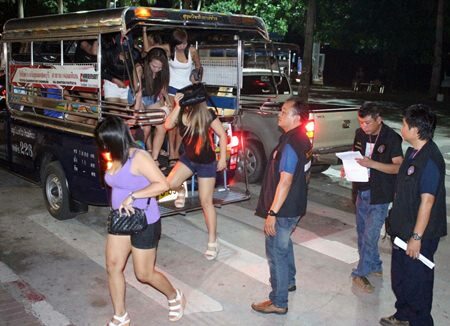 Alleged streetwalkers are transported en masse via baht bus to Pattaya police station. The suspects were transported en masse via baht bus to Pattaya police station following complaints about tourists being drugged and robbed by streetwalkers and ladyboys. As was the case with a similar Beach Road sweep a week ago, all the suspects were simply fined and released.